Our CVO-5, 5 cubic ft vacuum oven is connected to the oil-free, rugged, Welch CB2052 diaphragm pump. Model CB2052 vacuum pump is a private label version of Welch’s 2052B-01. The vacuum pump interior is made of solvent resistant, PTFE diaphragms. The CVO-5 vacuum oven offers incredible temperature stability for vacuum drying and purging of pharmaceuticals, botanicals, slurries, or any temperature sensitive material. This vacuum oven will liberate solvents, water or other unwanted compounds in a small batch, R&D, laboratory environments. Processing Temperature Sensitive Material? The CVO-5 comes in both low temp & high temp versions. Be sure to get the low temp CVO-5 version that has excellent temperature uniformity for products such as pharmaceuticals, slurries or any product that can be damaged or destroyed by temperature fluctuations. The CVO-5 STANDARD Package is shipped as heavy freight. Delivery to residences or no-forklift locations will add $120 for liftgate service. Cascade will contact you to arrange your specific delivery requirements. 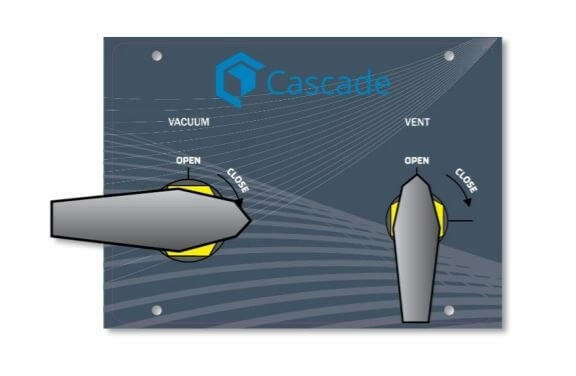 The Cascade CVO-5 uses a unique control logic not found in most lab grade vacuum ovens. The temperature probe is INSIDE the oven, which minimizes temperature overshoot and delivers best-in-class temperature stability and uniformity particularly in the low temperature ranges. Accurate, stable temps throughout the CVO-5 eliminate hot and cold spots, making accurate use of every inch of shelf space. The CVO-5 controller is a flat panel touch screen with built-in, controls that minimize temperature overshoot. When the oven door is open, the controller will wait and not aggressively call for heat to attempt to keep the oven interior stable. When the oven is being vented, the controller will pause as to not over-react and overshoot temperature during this temporary event. Turn the vacuum pump off and on from the oven control panel. No more reaching around, behind, beside to turn the vacuum pump “off” an “on.” Vacuum pump plugs directly into the back of the oven’s auxiliary outlet. 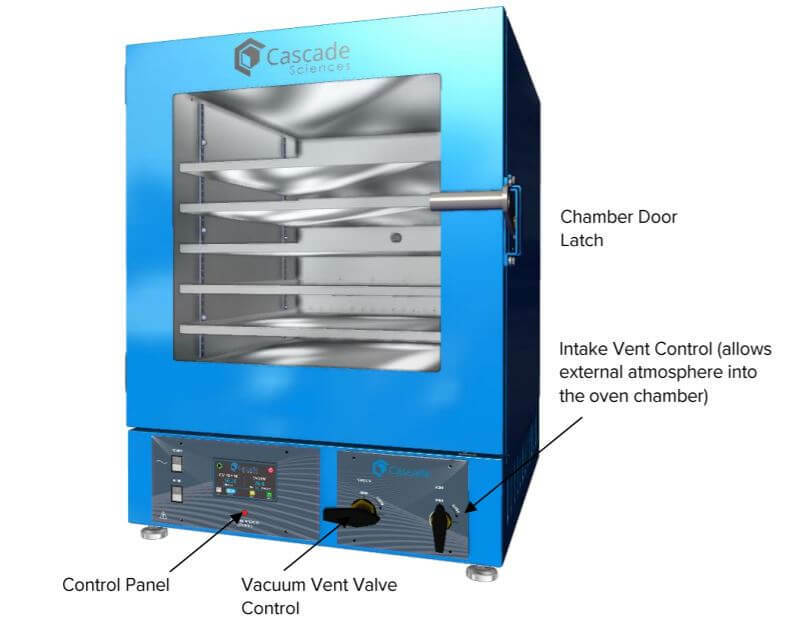 The Cascade Sciences CVO-5 is equipped with a heating cutoff system that will automatically stop power to the heaters when the oven shelf temps exceed 392°F or 200°C. This protection system will provide peace of mind for overnight processing or unattended vacuum bake outs. The CVO-5 features a rear mounted data port which outputs a digital log line once per minute. Viewing/logging this data requires terminal emulator software such as the open source (BSD License) emulator Tera Term. The CVO-5 Vacuum Oven comes certified by the Nationally Recognized Test Lab, TUV. This certification is a requirement by many municipalities and is often an extra charge on low cost ovens. Cascade Sciences manufactures our ovens in Oregon, USA. We are proud of our ISO 9001 Certification/Accreditation. Each oven completes a series of quality assurance procedures before shipment. The CVO-5 ovens offer two different vacuum oven connection points. The standard connection is a 3/8th dia barb located at the rear of the oven. It is connected to the vacuum valve level on the front control panel. For even faster evaporation, purging or drying consider upgrading to the MAX EVAP connection kit. The MAX EVAP connection kit secures to the oven’s rear 1” dia KF-25 port located on the back center of the chamber. The MAX EVAP connection never reduces flow by continuing with 1” diameter vacuum rated clear lines, a 1” dia KF-25 side mounted vacuum valve and KF-25 fittings and hardware. This KF-25 port can also be used to run temperature feedthrus, or monitoring sensors inside the vacuum chamber during processing. Cascade ovens are made in Oregon, USA with high quality materials. Our glass is NGI-USA Tempered and certified to ANSI Z97.1.2007 16CFR / 201 11. 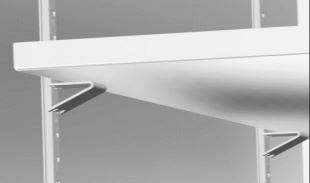 Our door handles are rugged brushed steel, not plastic. Our vacuum vessels are constructed with American made steel. We’ve tried lower cost, imported steel. But over time, vacuum chambers made of lesser quality/lower tolerance material cannot withstand the flex and pressure changes of vacuum pumping/venting/purging. This can deteriorate vacuum integrity and the oven will lose its ability to hold vacuum. The CVO-5 (TVO-5) come in both low temp and high temp versions. The low temp version has excellent temperature uniformity for temperature sensitive material. The higher temp version, 220°C has a uniformity about 6.5% of setpoint. At time of order we will verify the high / low temp version you require. Want a faster vacuum purge with deeper vacuum? The CVO-5 PRO Package is ideal for higher thru-put, faster purge times pulling deeper vacuum. It includes an Agilent IDP7 oil-free scroll pump and Cascade’s MAX EVAP Connection Kit.